I reported both of these issues to the WPF team when I found them, but unfortunately they weren't able to address them for the .NET 3.5 SP1 release. Although it might put LayoutTransformControl out of a job, I'm optimistic that both will be fixed in a future update of WPF. :) For the time being, though, I humbly suggest giving LayoutTransformControl a try if you encounter unexpected behavior like this. It's probably the quickest, easiest patch you'll find! You've probably already recognized ScaleY=0 as something of an edge case for layout: a value which collapses everything into nothingness. 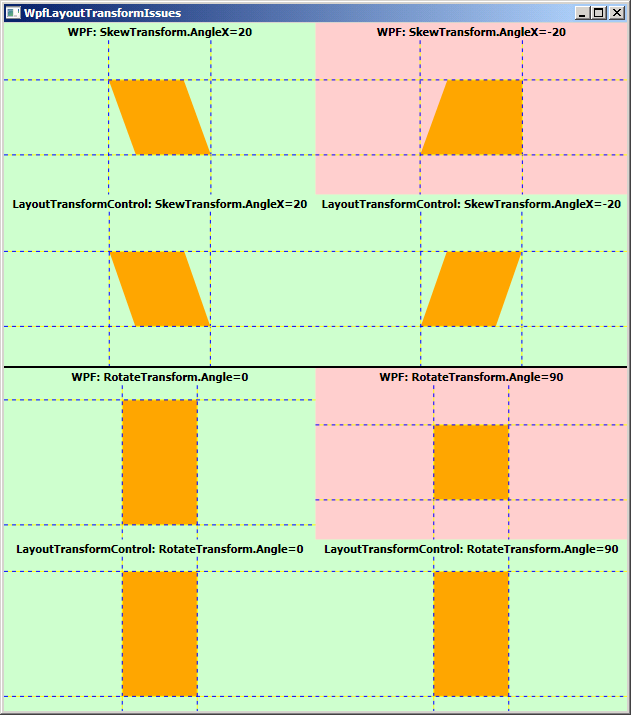 I looked into how WPF's LayoutTransform code handled this situation and discovered that it specifically detected circumstances corresponding to a transformation matrix without an inverse - and skipped performing the usual layout computations. My LayoutTransformControl implementation didn't look for this special case, ended up violating one of the rules of the layout system, and triggered the reported exception. So I added a little bit of code to handle such input the same way WPF does. And while I was at it, I checked to see if maybe there were other special cases that LayoutTransformControl wasn't handling properly... Sure enough, I found one other scenario: that of needing to layout within an container having no width or height. In this case, LayoutTransformControl's behavior wasn't wrong enough to cause an exception (or any visible problem I noticed), but I made a similar tweak for consistency with WPF. Changes to code always involve a certain amount of risk that a regression will be introduced. Fortunately, the changes here are small, self-contained, and easy to test - so I'm optimistic they won't cause problems for those of you already using LayoutTransformControl in your projects. Of course, if there are any new problems - or existing ones I don't know about yet! - please let me know and I'll look into them as quickly as I can. Thank you for your help - happy LayoutTransform-ing! To be clear, I wasn't involved with the porting efforts and I haven't reviewed the source code for either sample. However, I bet these are both still great learning resources for new Silverlight developers! 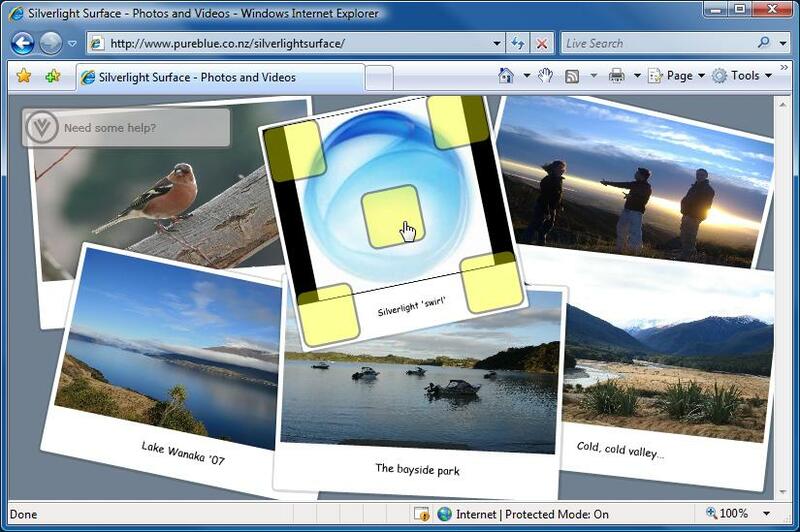 Thank you to everyone out there who's helping to make Silverlight fun and easy to learn. I updated my HtmlTextBlock sample for RTW last night and got an email from kind reader Ed Silverton this morning pointing out a problem setting FontSize on a standalone instance of the control. (Background reading: HtmlTextBlock Announcement for the Alpha, Improvements, Beta 1 Update, Data Binding Support, Beta 2 Update, RTW Update) Unfortunately, this problem does not demonstrate itself in the sample project, so I missed it. :( Sorry about that! 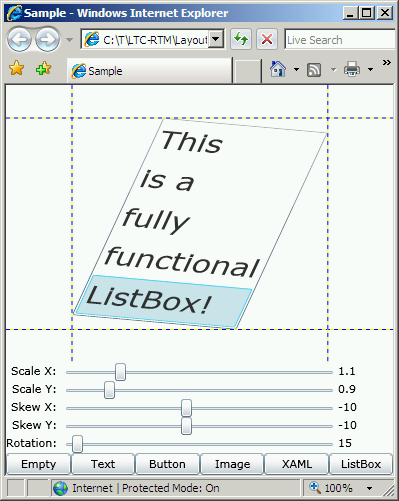 Ed's scenario was that of setting the FontSize or Foreground properties in the XAML for an instance of HtmlTextBlock; he observed that they did not take effect. What I think happened is that these Silverlight properties became inheritable between Silverlight Beta 2 and RTW, so the code in HtmlTextBlock to set up TemplateBindings to them was interfering with their normal operation. I simply removed the code in HtmlTextBlock that deals with the inheritable properties: FontFamily, FontSize, FontStretch, FontStyle, FontWeight, and Foreground. (Note that TextDecorations doesn't count because it's not present on the Control class HtmlTextBlock derives from.) After that, all was well. Mostly, that is... Ed's scenario now worked fine and so did the sample page - except for when the font size was changed to a small value. After that, changes to the font or size had no effect. Specifically, this problem seems to occur once the size of the text is small enough that the TextBlock fits completely within the bounds of the HtmlTextBlock. Not completely surprisingly, any changes to the TextBlock.Text property cause it to update itself correctly. I don't have a great deal more time to investigate this at the moment, and it's seeming like it may be an issue with Silverlight's TextBlock (I'll follow up internally), so I worked around the problem in the sample page (note: not the HtmlTextBlock code which I think is correct) by resetting the Text property when the font or size is changed by the user. I've updated the HtmlTextBlock demonstration page and the source code download, so you can try things out in your browser and/or download the code to see how it works! 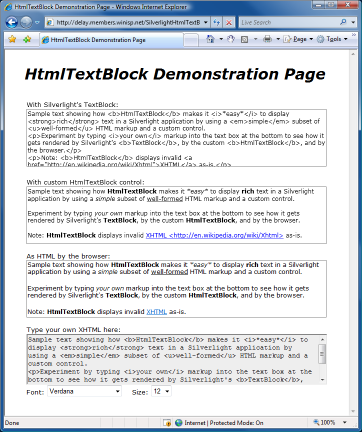 A couple of readers have asked about an update to my long-running HtmlTextBlock sample for Silverlight 2 RTW. (Background reading: HtmlTextBlock Announcement for the Alpha, Improvements, Beta 1 Update, Data Binding Support, Beta 2 Update) One person went so far as to migrate it himself after emailing me! :) He said the process went well, and I spent a bit of time on the bus ride home doing the migration myself to understand what was involved. The only change to the Beta 2 code was to handle the fact that the type of the object returned by HtmlDocument.GetElementsByTagName is now a base class of the HtmlElement instance the code was expecting. After a simple application of the as operator, the code compiles and works like before! 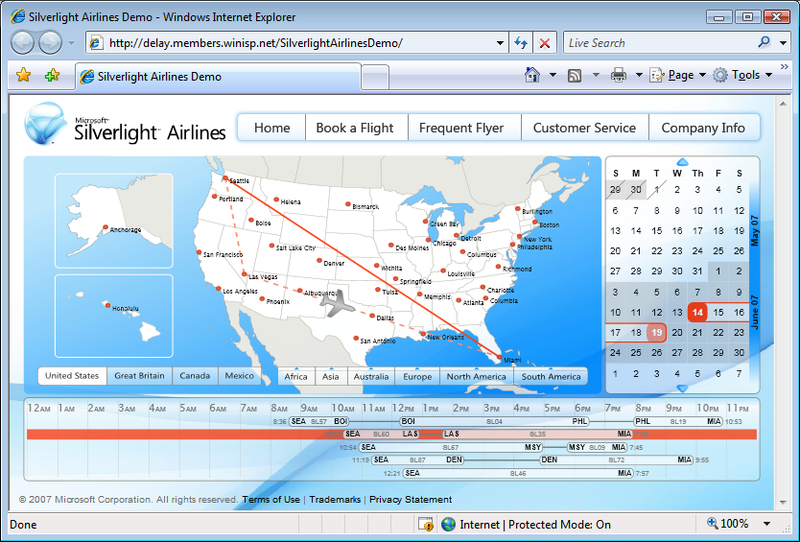 It's been nearly two weeks since the Silverlight Toolkit's November release. I've been trying to keep up with what's been written about Charting and want to summarize some of the most helpful posts I've seen so far. Many, many thanks to everyone who has spent time helping others learn how to use Silverlight Charting! Kind readers Eugenio and Thimp independently reported that the initial version of ChartBuilder did not work well on machines with certain culture settings. Specifically, ChartBuilder was inadvertently using the CurrentCulture for formatting numbers in XAML and that's a problem because the XAML is parsed according to the InvariantCulture. For example, on German machines ChartBuilder would write a double value to XAML as "1,23" according to the German culture settings - and the XAML parser would complain that wasn't a valid value. I'm usually able to catch problems like this by running code analysis and fixing all the Microsoft.Globalization warnings like CA1305, but in this case the code was calling objectInstance.ToString() which doesn't have any IFormatProvider-based overloads and therefore generates no warnings. Added support for the Axis.Interval property. Now it's possible to customize the frequency of the labels, tickmarks, and gridlines on an axis. Updated the version to 2008/11/06. Again, sorry for any trouble. I hope the updated ChartBuilder works well for everyone - and that you enjoy the minor improvements! 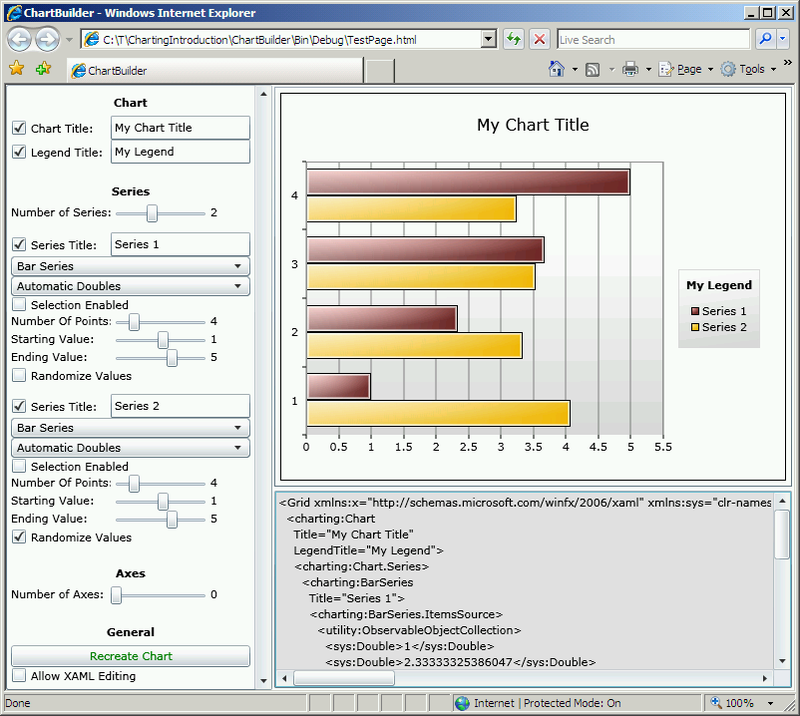 You can click this text or the image below to run the latest ChartBuilder in your browser. CD/DVD disc, mounted in a virtual CD/DVD drive, or opened in an ISO viewer. Note that direct access to a CD/DVD volume requires administrative privileges. without the loss of any successfully extracted data. ExtractISO has been available to anyone inside Microsoft since I wrote it. Last week, I got an unexpected request to make it public so certain customers could use it. I was happy to do so, but one thing had been bothering me for a while: the status display of the bytes extracted so far didn't group by thousands. Instead of "1,000,000", the counter displayed as "1000000" which I find more difficult to parse. This was such a small issue, I never got around to fixing it - but now seemed like the ideal time to do so! Unfortunately, this formatting task which is so simple in .NET seems to be quite a bit more involved with the Win32 API. The first problem is that printf doesn't support outputting the thousands separator. I considered using something like the sample code the previous link suggests, but wanted something simpler and easier to understand. A bit of research turned up the GetNumberFormat API which seemed like the perfect solution. However, the GetNumberFormat API suffers from at least two notable shortcomings: it's not easy to customize the output and the input needs to be a string. I did a quick test and found that the output of GetNumberFormat for "1000000" is "1,000,000.00" (on my machine using the default United States settings). This is close to what I wanted, but displaying the integral byte count with two digits of decimal precision just seems silly to me. So I looked for an easy way to customize the output via NUMBERFMT, and ran into the same issues Michael talks about in the post I linked to. When further research turned up no better alternatives, I decided to use GetNumberFormat and then "fix" its output by calling GetLocaleInfo(LOCALE_SDECIMAL) and removing everything after the localized decimal character(s). I like this approach because it is almost all platform code (i.e., code I don't have to write/test) and should be correct for all cultures where numbers are written as "1,000,000.00", "1.000.000,00", etc..
Other than the formatting issue I've just discussed, I made no other changes to the ExtractISO implementation. The only things I did were to update some of the VERSIONINFO settings, tweak the Build.cmd script, and recompile with the latest Visual Studio 2008. ExtractISO works reasonably quickly, but it's worth mentioning that performance was specifically not a goal when I wrote it. The code implements a simple read/write loop with a 1 MB buffer and makes no attempt to interleave the two operations. The large-ish buffer should help minimize the overhead of the read/write calls, but I suspect a different implementation that issues the reads and writes in parallel would be faster. However, achieving that parallelism comes at the price of complexity - and I didn't feel the time it would have taken to write and debug that code was justified here. Even at top speed, the extraction operation is going to take a minute or two - an extra minute on top of that seems a small price to pay for simpler, easier to maintain code. You are welcome to disagree, of course. :) If you develop a faster implementation, I'd love to hear about it! ExtractISO is a simple tool with a simple purpose - and one that I've used quite happily for a number of years now. If you've got a hankering for ISOs and like free stuff, please have a look at ExtractISO! PS - ExtractISO cannot be used to duplicate audio CDs or copy-protected DVDs: audio CDs use a different storage scheme than data CDs and copy-protected DVDs store their encryption key in an "inaccessible" location of the disk. The results are nearly identical to what they were back in July when I first blogged about XapReZip, so the issue of sub-optimal default compression still seems to be with us. :( But the good news is that my original XapReZip script works just as well today as it did before! :) And even better news is that other folks have taken things a step further and written tools to make this even easier. Here's a post by Rob Houweling where he shares his ReXapper tool (a compiled, self-contained version of the same process). And here's a post I've just found by Valeri Hristov that uses 7-Zip - and appears to pre-date my original XapReZip post!